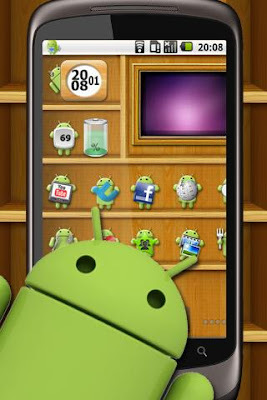 Android Theme Launcher LW - Live wallpaper launches apps ~ Android Forever! Live wallpapers typically confine their purpose to making your wallpaper do cool, animated things. This one goes a good ways further by allowing you to use it as a cool app launcher, too. "This is an adorable Android Theme launcher. Each Android (icon) has a unique movement on the rack and...is programmable to launch an application. There is a unique sound as well when you click on the mini Android." Android Theme Launcher LW is FREE on the Android Market!